Fluid Injection Safety Poster 18" x 24"
18" x 24" This poster contain information on obtaining five (5) critical pieces of information for doctors and emergency medical technicians in treating fluid injection injuries. Available in two sizes. 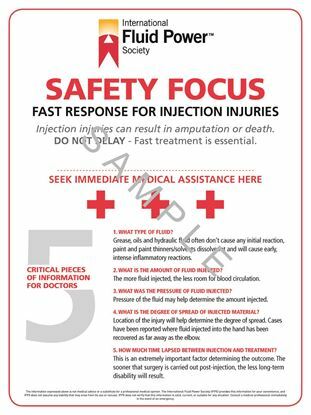 Fluid Injection Safety Poster 24" x 36"
24" x 36" This poster contain information on obtaining five (5) critical pieces of information for doctors and emergency medical technicians in treating fluid injection injuries. Available in two sizes.